Naval History & Heritage Command photo NH 47238. Samuel W. Preston was born near London, Ontario, Canada, on 6 April 1840 or 1841. Appointed to the U.S. Naval Academy in 1858, he stood first in the Class of 1862 when it was graduated a year early in response to urgent needs of the Navy’s rapid Civil War expansion. In October 1861, Acting Master Preston became flag lieutenant to Flag Officer Samuel F. DuPont, who commanded operations against South Carolina and Georgia. 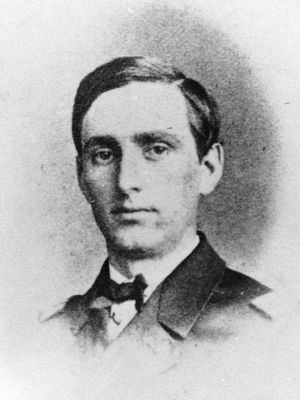 He was promoted to lieutenant at the beginning of August 1862 and his distinguished service with DuPont and Rear Admiral John A. Dahlgren made him one of the Navy’s foremost young officers. Lieutenant Preston participated in some of the combat operations that he had helped to plan. On 8 September 1863, he was captured on during an unsuccessful attempt to capture Fort Sumter, at the entrance to Charleston Harbor, South Carolina. After more than a year as a prisoner of war, he was released on parole and was formally exchanged in December 1864. As he was legally free to return to active service, he became flag lieutenant to Rear Admiral David Dixon Porter, commanding the North Atlantic Blockading Squadron. At Christmas 1964, Lieutenant Preston participated in an aborted Army-Navy attack on Fort Fisher below Wilmington, North Carolina. Three weeks later, Union warships renewed the effort by hammering the fort with gunfire while troops and a large force of sailors landed but on the afternoon of 15 January 1865, Preston was killed while leading part of the Navymen’s ground assault. Though repulsed, the charge assisted the Army in capturing Fort Fisher, thus closing one of the Confederacy’s few remaining seaports.